Somewhere in the slightly less reputable and budget conscious corners of the labs at Yamaha, the white coats have been at work. They have been mixing the core elements of naked bike-inium, not just stripping away the unessential fairings, windscreens, and bling, but paring down the internals. The result is the FZ-07, a 75 horsepower and 50 ft-lb of torque parallel twin budget bantam that punches way above its weight. Weight is something Yamaha’s clearly been excising ruthlessly. The horizontally mounted, adjustable rear shock bolts directly to the engine. The stress that would have been put on the frame diverted instead to the engine’s solidity, so the compact chassis can use a light tubular frame as backbone for further savings. 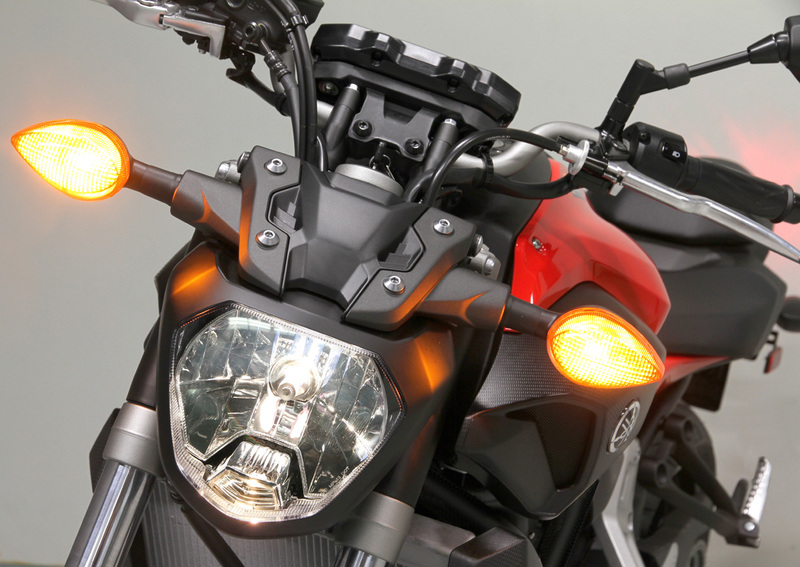 There’s a decompression unit that allows for a lighter starter motor, and down the chain of light-begets-light, allows for a lighter battery. The paring down continues with internals; the clutch (Yamaha claims) is one of the smallest ever in a 75hp bike. 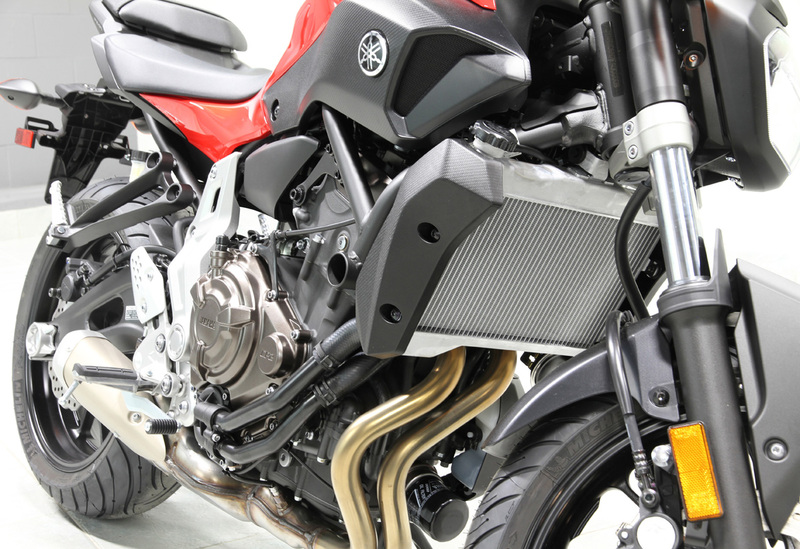 The FZ-07’s 180kg wet weight has put other offerings in the class on notice. The Yamaha is 22kg lighter on the scales than Kawasaki’s ER-6N, 24kg featherier than the Suzuki Gladius, and a whopping 36kg lighter than Honda’s NC750S. That’s friendly to riders new and established, and less weight also means less consumption. 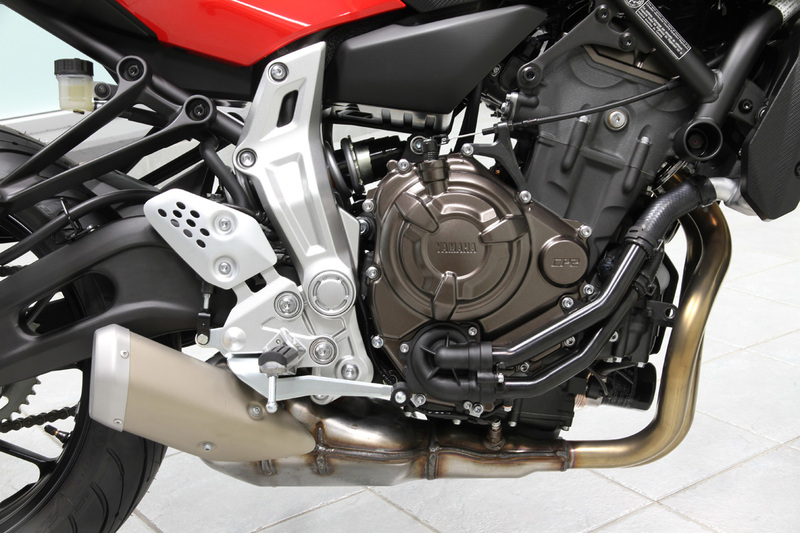 Which brings us to the output of the all-new, liquid-cooled, 689cc parallel-Twin engine; a claimed 75 crankshaft hp at 9000 rpm, while torque peaks at 50 ft-lb at 6500 rpm. 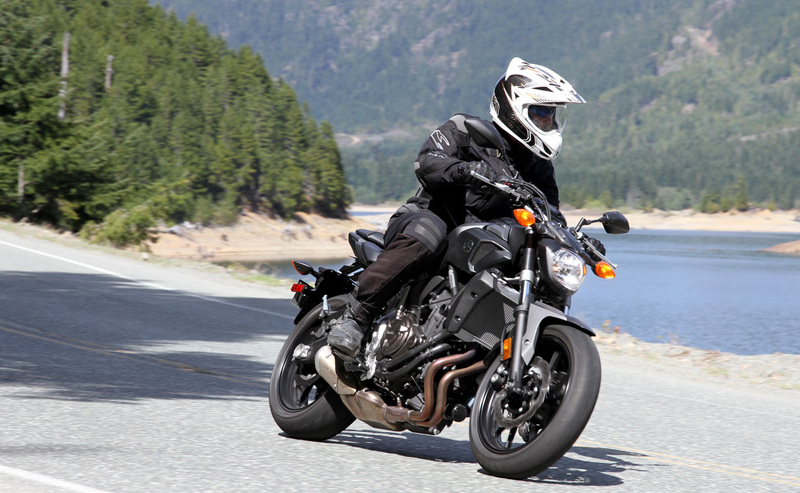 Between the low weight and some damn fine fuelling, the FZ-07 sips regular gasoline with a claimed fuel economy of 4.15L/100km, 24km/l or 56 mpg, providing a calculated range of 336km/210 miles from its small 14L/3.7-gallon gas tank. Yes, we’re waltzing through some numerical drudgery here, with an eye towards a salient point and literary counterpoint. 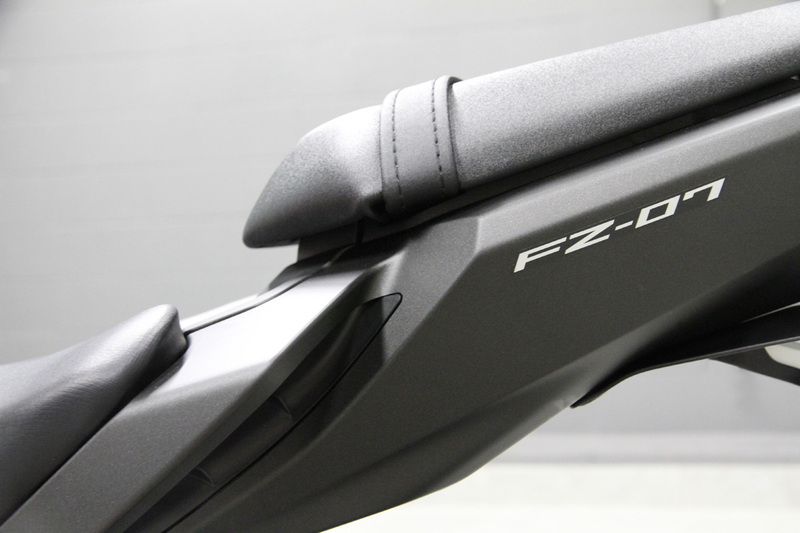 First the point; the US market doesn’t get the FZ-07… at the time of this writing. The counterpoint to the numerical housekeeping is that the ride experience will make it completely worth the US’s wait — in the parlance of social media marketers, “hashtag jealously”. 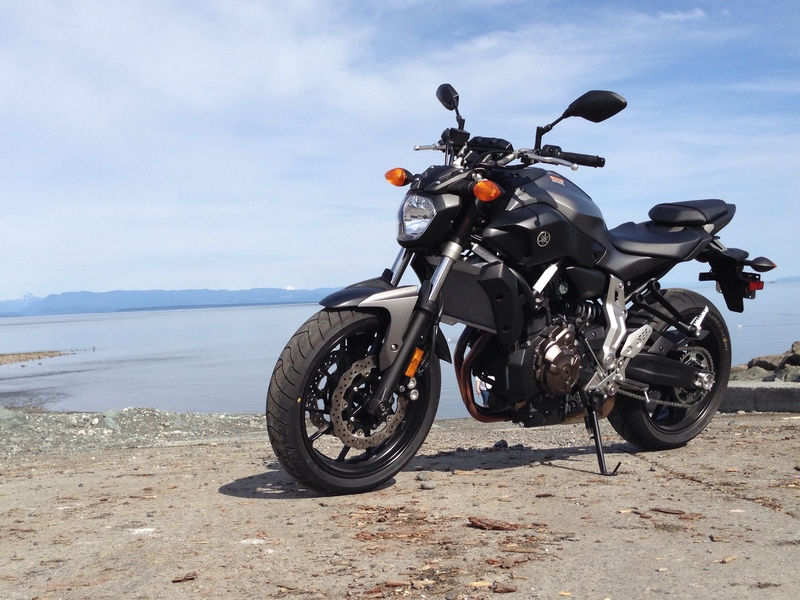 In the meantime, Canada, let’s thumb our noses at those in the lower 49, because frankly, the FZ-07 completely knocks your socks off in the ride department. Throttle response is impeccable. 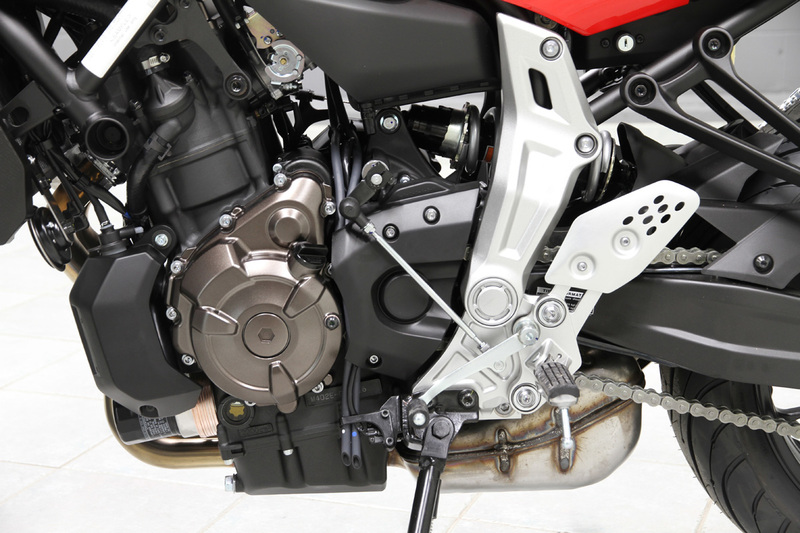 The 270-degree crank layout (which for us lay people means one piston up, while the other is at mid-stroke) imitates the sound and feel of a 90° V-twin. 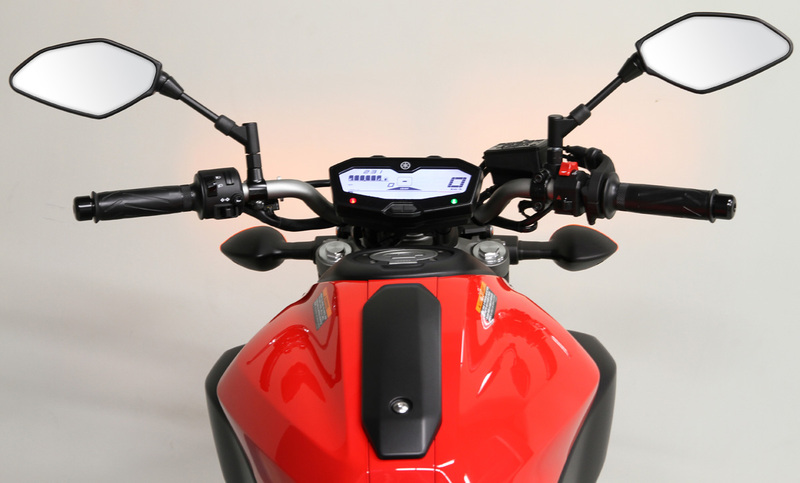 The power pulses produced by this configuration, Yamaha and physics say, offer better traction, while the less desirable twin-vibration is reduced to clear-in-the-rear-view-mirror naught by a balancer shaft. On the topic of “cranks”, crank the throttle and the linear power band provides smooth and forceful delivery from a basement low 2000rpm. This isn’t brute force delivery though, output is “meet your second bike” controllable without being tamed to boredom (we’re looking at you Honda NC-series). Sweep through the tach towards the 10,000 rpm redline, and the FZ-07 pushes you back into your seat with an electric linearity. Climbing through the snick-snick-snick of the six-speed gearbox with the light clutch is nearly effortless, and around town an almost needless affair. Again, with an eye towards ease of use, the ratios are widely spaced, taking advantage of the engine’s wide, flat power-band, and minimizing shifting. 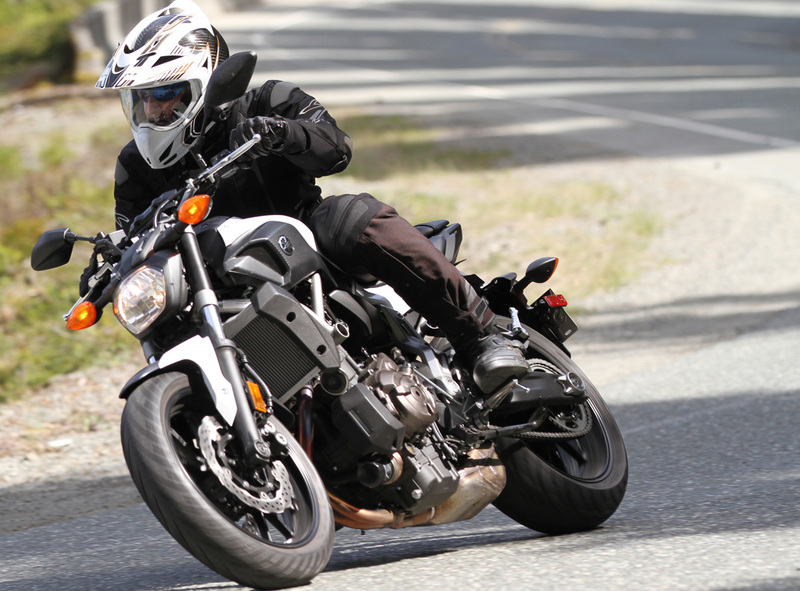 Undoubtedly, the FZ-07 will happily take you to highway speeds and beyond, and you know what? You won’t suffer for it. Luckily, information density doesn’t require physical space or the FZ-07’s digital dash would be a full wall CIA-war-room. 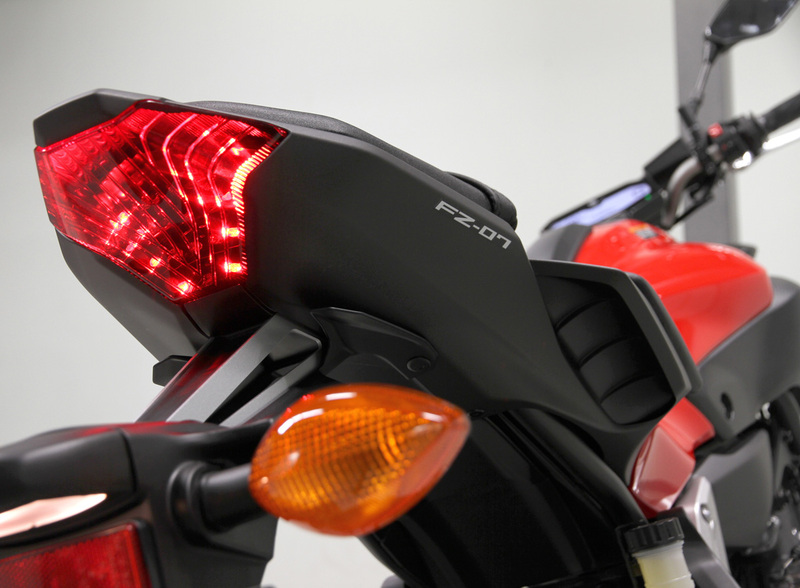 The LCD includes a bar-type tachometer, speedo, dual trip meters with fuel reserve countdown, clock, gear-position indicator, ambient temperature gauge, and a fuel economy computer – complete with ECO light indicating when you are riding in a fuel-friendly manner. It is rumoured that some journalists have even see this indicator, like a glimpse of an elusive and endangered species caught out of the corner of your eye. The dash is an easy eye fall from the upright seating position. Here you’ve a slight forward reach to the bars, and easy comfortable leg position to the low (by sport bike standards) pegs. New riders, and those shy on inseam, will find the low 805mm/31.7inch seat height a boon in the parking lot paddle. The seat also narrows at the front, in another new rider gesture, making the ground a little easier to reach. In a day long run from Courtney to Gold River, BC, I can happily confirm all day comfort. 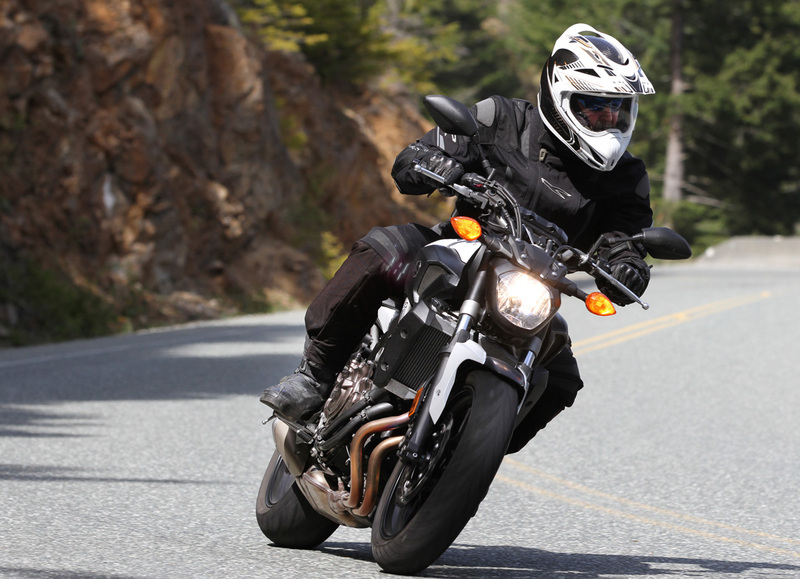 Wick things up in the sweepers and the FZ-07 offers a graceful, predictable and neutral execution of sweepers, with only light steering input; it is remarkably composed. As things tighten, the chassis and suspension acquit themselves nicely. When the road starts to roughen though, things come a bit undone. Doing suspension on a budget is a heck of a trick, and if there’s one place Yamaha has fallen short on this bike it’s the rear shock. As a rider at 190lbs, the rear feels underdamped. 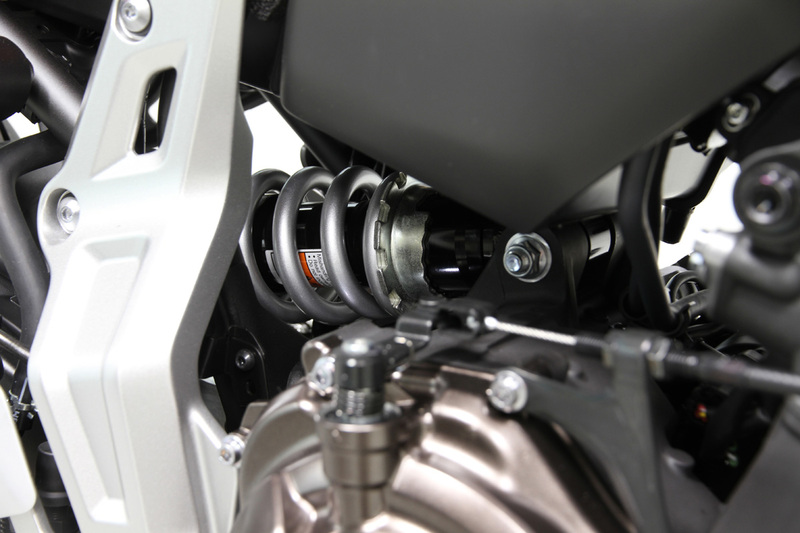 Hitting a heave in the road, or a dip, and the rear shock rebounds too quickly, adding a little extra bounce. The chassis and beefy 180 rear tire keep everything in order, but the FZ-07 would benefit from adjustability beyond preload. Lighter riders should be well off with the setup however. Up front, surprisingly, I’ve no complaints about the conventional 41mm fork. Yamaha may have been too frugal in the rear shock, but they haven’t spared anything in the way of braking. 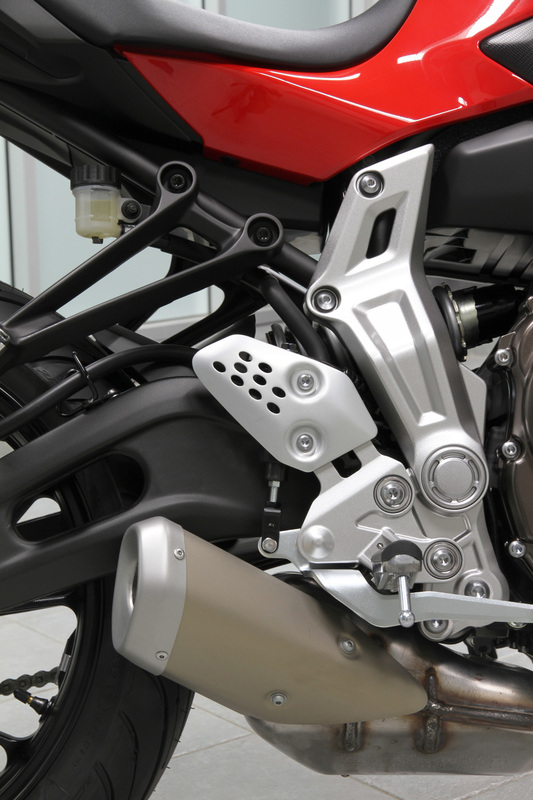 Up front, the twin four-piston mono-block calipers are lifted from the R1and put the clamps to 282mm discs – softer pads gentle the system into acute usability. In the rear, there’s a single-piston caliper and 245mm disc. 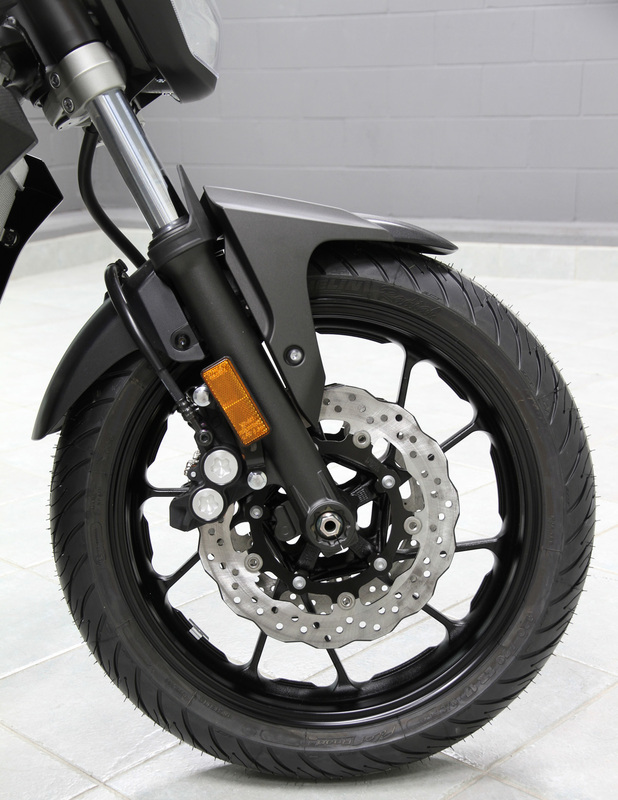 Braking is an easy two-finger affair, you’ll not be wanting for braking feel or power charging into the turns. 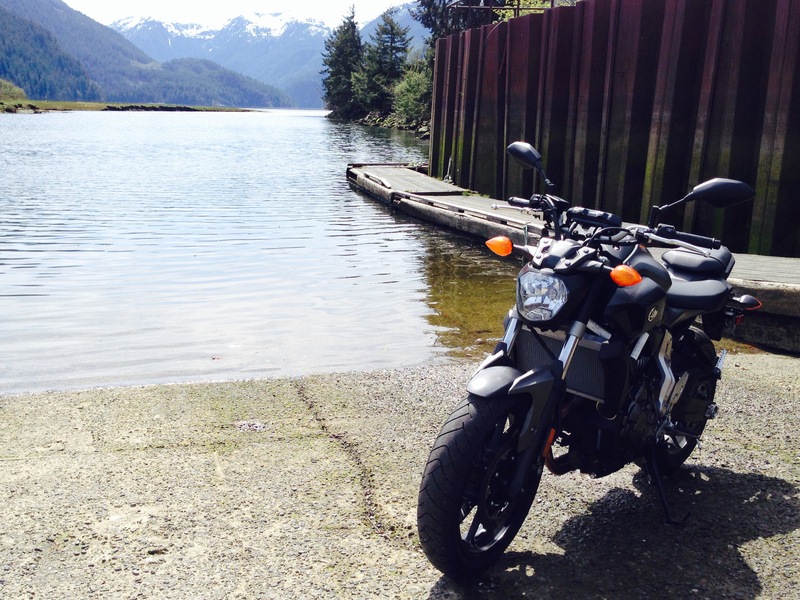 The ease of modulation is likely a good thing as the FZ-07 isn’t being offered with ABS in Canada. Circling the bike, hounding its angles for photos, that ‘lack’ brings us to the real value of the FZ-07. Visually, it’s stylish but spare. That elemental essence of bike is delivered by Yamaha concentrating on usable power, braking, chassis dynamic and shifting rather than the electronic gee-wizardry of traction control, ABS, or power modes. In doing so Yamaha has produced something very rare; a pure, or perhaps purist’s, bike, calling back to other generational greats before motorcycles got legislated into complexity. Focusing on a bike’s essentials, Yamaha can deliver one final blow to its competition with the FZ-07 – pricing. At $7,299 CDN Yamaha intends to be a Honda CBR250R or Kawasaki Ninja 300 rider’s next bike, by coming in at over $1000.00 cheaper than the middle-weight competition. Everything Yamaha has done to simplify the FZ-07 has boiled away unneeded elements, leaving the bike lighter, simpler, more rideable, and more elemental, creating what should be a decade’s defining bike. 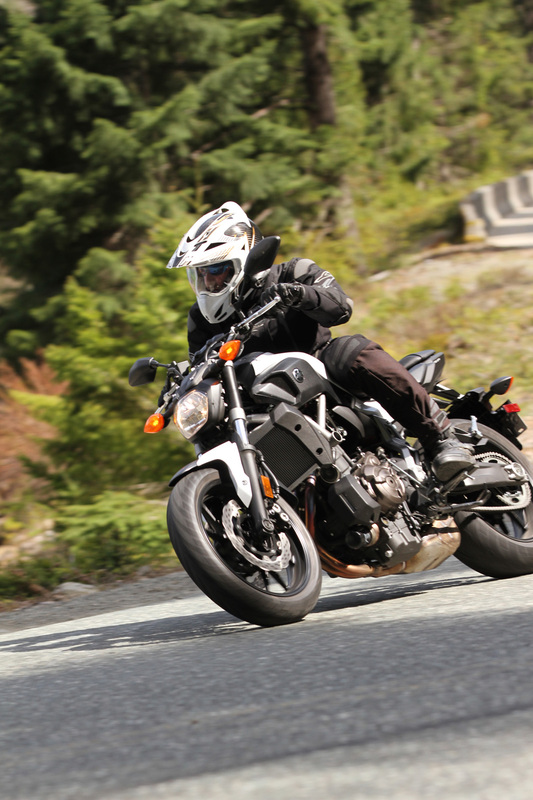 The Yamaha FZ-07 shows that less can be so much more. 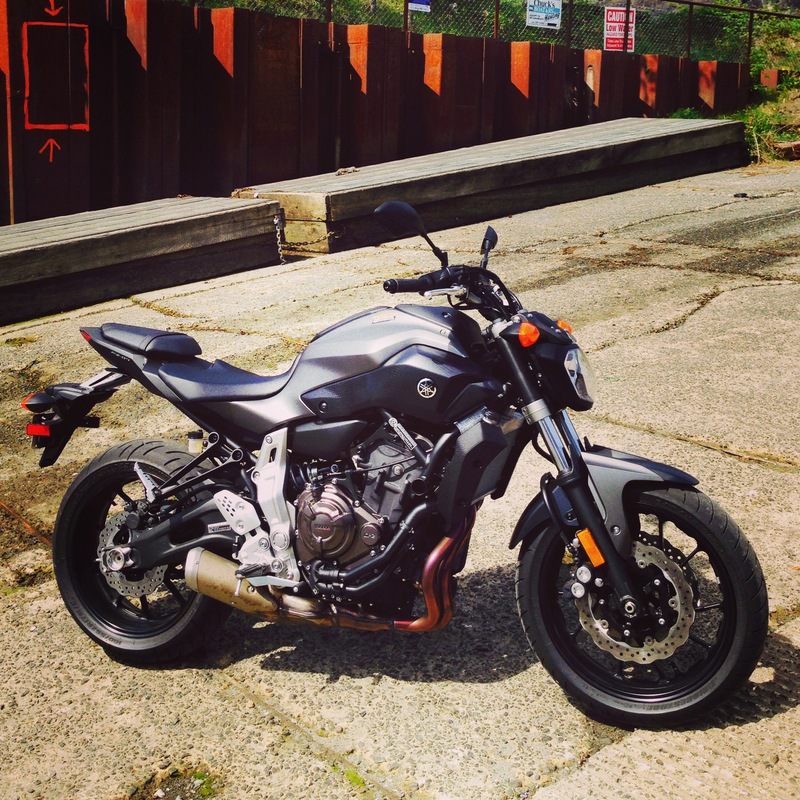 As always a really great article but the fz 07 has been available in the US since late June . Great article! Wish you guys were still making videos! They are among the best on youtube! I think the author did a wonderful job catching the essence of this bike, while highlighting its strengths and identifying its weakness(es?). How long before the aftermarket creates a better damped shock with a stronger either linear or progressive rate spring for under $600 USD? I bet this Summer (2015) there will be an excellent swap available- and, I’m sure that enterprising folk are already checkig the Yamaha parts bin for a high quality item. Although I ‘fit’ (180 Lbs with gear), I still can’t load saddlebags or, put my partner or step daughter on it. But, that single issue addressed and I have a BETTER FJ-07 than the FJ-09 will ever be. Better power delivery, lighter weight for manhandling when greenlaning- easier to fix while in the woods, and, all of the needed protective parts are already in the market. I can’t wait, and, I bet those in the Great White North can’t wait either…for a bike that will extend their limited season.